Pervy security guards be warned, your days are numbered. 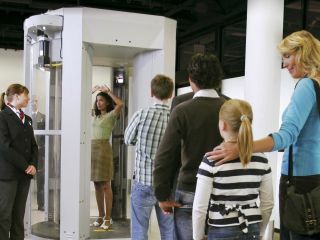 Electrical engineers from the University of California have created a new type of circuit for passive millimetre-wave imaging that should lead to cheap hand-held imaging systems for identifying concealed weapons at airports. The new circuits use standard silicon semiconductor technology, while today's security imaging systems working in the same frequency range rely on expensive rare metals. Imagers operating at millimetre waves are particularly useful because they pass through clothing largely or completely unaffected and can resolve images down to a millimetre scale, which is fine enough to identify small objects and separate items on a person's body. "By the size of the signal we detect, we can tell the temperature of the signal we are looking at," explained Gabriel Rebeiz, electrical engineering professor at UC San Diego. "A ceramic knife concealed against a person's leg, for instance, might appear half of one degree cooler than the rest of their body. We could then tell that something is there and we could exactly determine its shape." Using signal processing, these kinds of scanners can put together an image of a temperature map of a person's body that includes objects underneath their clothing.